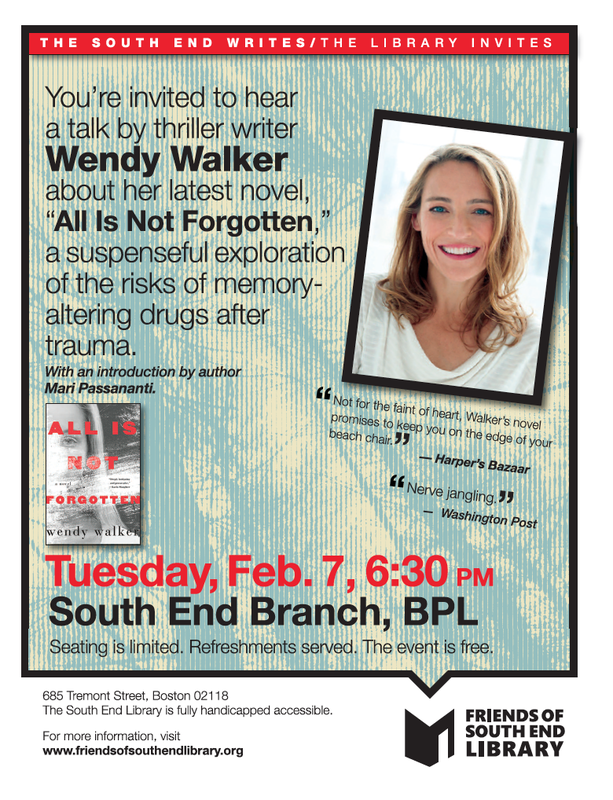 Wendy Walker’s first suspense novel, All Is Not Forgotten, is set in the small town of Fairview, CT, one of those irresistible locations for writers to explore because it seems so perfect but really isn’t. No one better to delve into this than an author who is a suburban dweller with a growing family herself, and who also happens to be a family-law attorney, likely to know some of the real-life complications simmering underneath the American suburban dream. William Landay (Defending Jacob), another attorney-turned-suspense-author who read for South End Writes in 2014, said Walker has “a polished writing style in a novel that blends suspense and rich family drama,” so chances are good you will have an enjoyable few hours with this psychological thriller, wondering whodunnit and why. The plot revolves around a family whose secrets and unresolved tensions become sharply articulated and inflamed when a crisis occurs, in this case, an attack on the teenage daughter during one of those parties with too much liquor, testosterone and drugs. She is given a drug to reduce the trauma, but it leaves her with feelings of anger and despair over the assault that the memory-altering drug does not alleviate. Worse, she can no longer remember the facts of the assault, which also prevents the attacker from being found. As the plot twists and turns to an unexpected conclusion, the parents are divided over what matters most, revenge, justice or…staying in tune with their town’s country club mores. Walker published two novels with St. Martin’s Press and is currently writing her second thriller. She will be introduced by her colleague an FOSEL advisory-board member, Mari Passananti. The South End Writes is sponsored by the Friends of the South End Library. All the events are free. Books by the speakers will be available for borrowing, sale and signing by the author. The branch is fully handicapped accessible. We serve refreshments. Seating is limited. Below are listed upcoming authors, whose bios will be more detailed as the dates of the talks approach.